Get to know the CEOs, investors and consultants converging on Bentonville this week to decide the future of the company. This week Walmart shareholders will gather in the retail giant’s Arkansas backyard and re-elect a board of directors charged with guiding the company over the coming years. Walmart’s board—rife with billionaires and industry titans—has recently become a lightning rod for company critics. During their lengthy and high-profile business careers, several board members have faced allegations—from worker exploitation to financial malfeasance—that parallel those facing Walmart itself. Over the past year, labor activists have targeted board members with dossiers on the Internet and protests around the country, from a hunger strike and vigil by guest workers outside Michele Burns’s New York mansion, to demonstrators placed along the route of a Bay Area marathon to shout messages at Greg Penner as he ran towards the finish line. Over the past week, striking retail workers from the union-backed group OUR Walmart have staged a series of board-focused protests, including one at Yahoo! CEO Marissa Mayer’s Palo Alto mansion, and another outside her penthouse atop the San Francisco Four Seasons hotel. 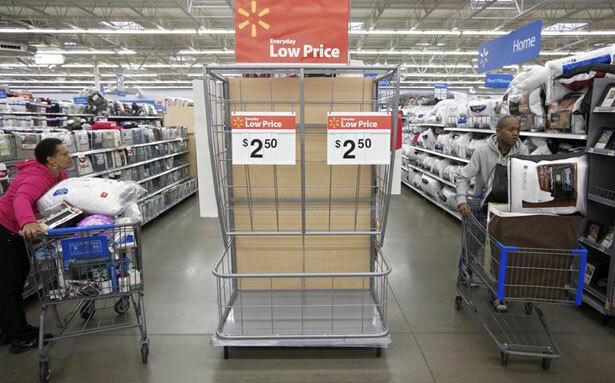 While Walmart’s shareholder meeting won’t kick off until Friday, strikers are already in town. This week they’ll try to win over some of the workers flown to Arkansas by management, and to draw shareholders’ and reporters’ attention to OUR Walmart’s allegations of illegal retaliation and their demands regarding Walmart’s working conditions. They’ll also work to shine light on recent company controversies regarding reported bribery in Mexico and factory deaths in Bangladesh. Friday’s meeting also follows a quarterly earnings report that drew some less-than-glowing headlines in major outlets (New York Times: “Wal-Mart Sales Go Cold, and Its Shares Feel the Chill”; USA Today: “Wal-Mart 1Q profits, revenue disappoint”; Los Angeles Times: “Wal-Mart reports weak 1st-quarter sales, blames weather, tax issues”). The United Food & Commercial Workers union seized on the earnings report as the latest sign of trouble at Walmart, along with New York Times and Bloomberg articles suggesting understaffing is driving away customers, and the announced departures of three board members and two executive vice presidents. Meanwhile, Walmart has recently touted the launch of its plan to hire 100,000 veterans over five years; the expansion of a conservation partnership with the National Fish and Wildlife Foundation; and a tally of over $1 billion in charitable donations (counting cash and in-kind contributions) in the previous fiscal year. The company did not respond to requests for comment for this story. I’ll be reporting from Arkansas this week—watch this space for updates starting Thursday. But first, here’s The Nation’s guide to the seventeen current members of Walmart’s board, and some of the controversies they’ve encountered. Three members of the Walmart Board are members of the Walton family—relatives of Sam Walton, the company’s late, iconic founder, whose business philosophy is often touted by the company’s defenders and critics alike. Sam’s son Rob Walton is the board’s chairman. The Waltons aren’t just sitting on that cash. As individuals and through their Walton Family Foundation, they’ve given generously to a range of causes. That includes long-standing support for individuals and organizations out, in the words of the foundation, to “infuse competitive pressure into America’s K-12 education system.” Last year, Alice Walton put $1.7 million behind the successful effort to pass a pro–charter school bill in Washington state. In April, three weeks after the release of a confidential memo renewed scrutiny over cheating during Michelle Rhee’s tenure as DC schools chancellor, the Waltons’ foundation announced an $8 million grant to her advocacy group StudentsFirst. Meanwhile, the Wisconsin Center for Investigative Journalism found that in the state’s 2010 legislative elections, which swept in the majorities that passed a raft of right-wing bills, Walton family members made up six out of the top fifteen individual donors to the winning candidates (that includes board members Jim Walton and Greg Penner, Sam Walton’s son-in-law). And the Walton Family Foundation was listed, along with Walmart, as a “Chairman”-level sponsor of a 2011 meeting of the conservative American Legislative Exchange Council (ALEC). While Walmart announced that it was cutting ties to ALEC following pressure from activists in 2012, the Walton Family Foundation has announced no such move. In 2011, Greg Penner and two other finance professionals created a PAC called Govern for California, whose declared priorities include changes to public employee pensions and prison sentencing. Govern for California backed former Teach for America official Brian Johnson’s unsuccessful campaign for a California assembly seat “as an education reformer”; Greg’s wife Carrie Penner also donated to Johnson, and gave $222,000 between 2011 and 2012 to the independent expenditure committee of a California education reform group that supported him. Although GFC calls for “raising revenues if and when needed,” Penner donated $250,000 in 2006 to oppose a ballot initiative that would have raised taxes on the wealthy in order to fund universal preschool for California’s 4-year-olds. While Walmart is the Waltons’ biggest business, it’s not their only venture to court controversy. Greg Penner is a founder and managing director of Madrone Capital Partners, a firm investing Walton money. (According to an investor summary by the financial research company PrivCo, Madrone “primarily manages the Walton Family’s investments in growth private companies”; the private equity firm DT Capital touts its ties to “Madrone Capital in the US, the investment entity for members of the Walton family.”) Madrone has invested in—and Penner is one of five board members of—Baidu, China’s top domestic search engine, which was started with money invested by the firm Peninsula Capital while Penner was a general partner there. Walmart, the Walton Family Foundation, Baidu and Greg Penner (contacted via voicemail at his Madrone Capital Partners office) did not respond to requests for comment. Two-thirds of Walmart’s current board members—twelve out of seventeen—are current or former CEOs (that includes Arvest Bank’s Jim Walton) . Between them, the CEOs on the board helm or helmed five name-brand US companies (Coke, Pepsi, Yahoo!, Marriott and of course Walmart), an ad agency, an investment fund, an investment bank, the top retailer in Australia and a consulting firm’s retirement think tank. The board includes former Walmart CEO H. Lee Scott, who helmed the company during the comparatively weak labor protests of the 2000’s, and current CEO Mike Duke, who succeeded him in 2009 (after stepping down at Walmart, Scott became an operating partner at Solamere Capital, Tagg Romney’s private equity firm). Last year, The New York Times reported that, despite "a wealth of evidence," "Wal-Mart's leaders shut down" an internal investigation of the allegations, and "authorities were not notified." In response, the Justice Department and congressional Democrats launched investigations into the company, and in January, congressional Democrats released e-mails showing Duke being personally informed of bribery allegations involving Walmart de Mexico as early as 2005, while he was serving as a Walmart vice chairman responsible for Walmart International. It’s unclear how long Duke will stay in his post—citing “a person close to the situation,” Bloomberg Businessweek reported May 7 that Walmart could name a successor “in the coming months.” Walmart’s proxy statement pegs Duke’s total compensation for the last fiscal year at $20,693,545. Like some of the controversies facing Walmart, the most serious allegation against Board Member Linda Wolf involved the limits of subcontracting. In 2004, one year before Wolf departed as CEO of the ad agency Leo Burnett, the US Army sued the company for allegedly overbilling the government by $20 million. The suit alleged that the company defrauded the government by claiming wholly owned subsidiaries of the company were in fact subcontractors. CBS reported that then–Chief Financial Officer Eric Martinez ordered an audit, but—according to the lawsuit—was fired by Wolf before he could conduct it. Leo Burnett settled the lawsuit for $15.5 million in 2009. Wolf chairs the Walmart board’s Compensation, Nominating and Governance Committee. Christopher Williams’ Williams Capital Group was one of several firms to which, The New York Times noted in 1998, then–New York Comptroller Carl McCall directed state pension fund contracts after receiving campaign donations from executives. Last October, Williams Capital Group announced the opening of a new Sacramento office as part of plans to “build upon and further expand our valuable services to municipal enterprises.” In April, Making Change at Walmart wrote to Williams’s potential clients to suggest that Williams’s service as chair of the Walmart board’s auditing committee should give them pause given the company’s Mexico bribery scandal. Perhaps the most famous CEO on Walmart’s board is Yahoo! executive Marissa Mayer, who took over the tech company last summer. Mayer has drawn a series of headlines over the past year: for her swift return to work after giving birth; for eschewing the label “feminist”; for eliminating the company’s work-from-home options; and most recently, following criticism, for increasing Yahoo!’s maternity leave. As with the controversy over fellow tech exec Sheryl Sandberg’s book Lean In, labor activists have seized on the conversation around Mayer in an effort to draw attention to challenges facing lower-wage women in the workforce. Reached by e-mail, a Yahoo! spokesperson said the company has been “very focused on making Yahoo! the absolute best place to work,” and declined to comment on Mayer’s role on Walmart’s board, or the allegations against Walmart. Labor-backed pressure could help explain why the Walmart board—currently seventeen members—appears about to shrink. Three of the current CEOs on the board are leaving, and Walmart’s pre-convention federal filing doesn’t list any replacements. All three of the departing members—Marriott CEO Arne Sorenson, Breyer Capital CEO James Breyer and Retirement Policy Center CEO Michele Burns—were among those targeted by labor activists for their involvement with Walmart. In a message to shareholders in Walmart's 2013 annual report, board chairman Rob Walton noted that Marissa Mayer and Tim Flynn had joined the board over the past year, that Breyer and Burns had served on the board for over a decade and that Sorenson had recently been promoted to Marriott CEO. In a letter to Linda Wolf and other board members prior to Walmart’s 2011 shareholder meeting, the Change to Win Investment Group (a group tied to unions currently backing organizing at Walmart) questioned Breyer’s and Burns’s listing as “independent directors” on the board. The CTW letter noted that Michele Burns then served as CEO of Mercer LLC, which Walmart had retained to consult on the company’s executive compensation; and that Jim Breyer was a partner in the venture capital firm Accel, a part owner of the social media company Kosmix, which had recently been purchased by Walmart. When Burns was appointed as CEO of Mercer in 2006, The New York Times noted that she had “left a number of shareholders, creditors and employees at her previous employer, the Mirant Corporation, disgruntled over the amount she was paid while the company was in bankruptcy reorganization.” That included $3.6 million in severance following a year and a half in the job. Burns is currently chairing the Walmart Board’s Strategic Planning and Finance Committee; she previously chaired its Compensation, Nominating and Governance Committee. A spokesperson for Marsh & McLennan Companies—parent of the Retirement Policy Center and of Mercer—declined a request for comment. Breyer Capital, Leo Burnett, Williams Capital Group and Marriott did not respond to inquiries. Progreso Financiero did not respond to a request for comment. Follow Josh Eidelson's blog for updates throughout the Walmart board meeting, from the back-room machinations to the protests outside.